One of the most compelling arguments made for free markets was an essay titled “ I, Pencil”, written by Leonard E.Read in 1958. In that, he writes about the complex economic activities involved in the creation of a simple pencil. The cedar wood comes from the forests of California and Oregon, is cut by labor from Mexico using saws made of steel that likely came from Japan or India; the graphite comes from mines in Sri Lanka; the copper ferrule from Chinese mines in South America; the rubber for the eraser is harvested by Muslim labor from plantations in Malaysia. But, how does the logging company in Oregon know how much wood to cut, or how much labor to hire; or how does the mining company in Sri Lanka know how much graphite to mine? Who coordinates the activities of complete strangers from different religions, nationalities, and ethnicities? Who ensures that each group, with different interests, is incented to produce enough material to make sure that a pencil is available every time you go to the store to buy one? It would clearly be impossible for a single mastermind, or a central planning body or a committee of bureaucrats to coordinate the complex ecosystem involved in making a simple pencil. How then does all this come about? What force ensures that resources are efficiently allocated and that there are no shortages or excesses? It all just happens–magically. That is the power of free markets. People, each in pursuit of their personal interests, willingly trade their labor, knowledge, and skills in exchange for payments to buy things they want that are in turn produced by complete strangers in other industries. This is the invisible hand of the free market. When left to its own devices the invisible hand efficiently allocates resources to produce the goods and services we need to improve our standard of living. No other system can allocate resources more efficiently than the free market. 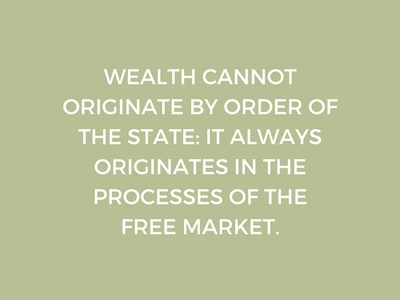 And the more complex a system, the more likely it is that it can only be developed spontaneously in the free market. The internet, the most complex of all networks, took shape with very little planning and without even a Board of Directors to guide its development. No single mastermind or government could ever develop or run a complex system like UBER that handles millions of cars every day all over the world, or a global information system like Google. Governments are too slow and cumbersome to keep up with the pace of change and disruption in today’s fast changing world. The free market has proven to be the most productive economic system by far of all available alternatives. The Heritage Foundation ( Index of Economic Freedom 2017 ) presents evidence that per capita income in countries with free markets is five times higher than in countries in which the government controls the economy. The free market system is also the only system consistent with individual freedom and rights, and therefore, vital to sustaining a free civil society. There are only two ways to coordinate economic activities. The first is through the voluntary exchange of a free market system, where both buyers and sellers willingly trade goods and services for payments. The other is coercive exchange under the direction of a government. Here exchanged is forced by the use of authority. A voluntary exchange is clearly the better option because it guarantees that both parties will benefit from the exchange. When you willingly buy bread from a baker, it is a voluntary exchange which must benefit both you and the baker otherwise it would never happen. Your benefit more from acquiring the bread than the Rs. 50 you have to forego. Otherwise, you wouldn’t buy it. Conversely, the baker has more uses for the Rs. 50 than the bread otherwise he wouldn’t sell it. The best thing about a voluntary exchange is that it will not take place unless both parties benefit. Also, since the baker must persuade you to buy his bread, he must pay attention to your preferences and the quality of his product. So even though he is doing it in his self-interest, he is indirectly also satisfying your needs. He knows he would benefit only if you benefit. The free market system encourages people to serve others to achieve their ends. This is how new ideas, products, and industries take shape–talented and ambitious people drawn by their self-interest to work hard and provide goods and services that others need. And therein lies the reason why the free market system works and why it has been able to raise standards of living across the world. The theory of the Invisible Hand is the driving force behind the success of free market economies. The concept is simple yet very powerful. If each consumer is free to choose what to buy, and each producer allowed to choose freely what to sell and how to produce it, the free market will automatically settle on a set of important variables like price, quality, quantity, and allocation of resources such that all participants, and society, benefit. And the free market does this impersonally and without a centralized authority to guide the process. The best thing about the free market is that it creates affluence for many with little cost even to a few. Can you imagine life today without access to the information available with a simple search on Google? Billions of people benefit in countless ways from products like Google developed in the free market. And, most of these products are available for us to use free of charge. The market system is also very impersonal. It separates economic incentives from political and personal views and protects people from being discriminated against in their economic activities. For example, we don’t know nor care about the religion or nationality or race or color of the people who run Google. We only care about how much we benefit from the use of the product. Similarly, the people at Google don’t care what religion or race benefits from the product as long as they profit from their efforts. The only thing that matters in a free market is that eventually, everyone benefits from the production and free exchange of goods. That is the magic of free markets. An exchange controlled by the government, on the other hand, brings distortions and inefficiencies like price and wage controls, subsidies, tax discrimination, excise and duty benefits to certain industries, etc.. Since exchange is not voluntary it always benefits one group at the expense of another. A minimum support price on agriculture products, for example, may help the farmer but it hurts the consumer. A subsidy or tax benefit to a particular industry provides a competitive advantage to that industry, but, at the expense of taxpayers, consumers, and other industries. The reason why the government cannot create a voluntary exchange is that it does not produce anything of any value. Can you think of a great movie, a great play, a great song, a great piece of art, a great invention, a new product, a disruptive technology that was developed by a government? Probably not, because almost everything of any value that we have today was developed in the free market in response to creative people trying to make their lives better. The greatest achievements of mankind have come from the efforts of individuals and not from a central planning committee or a government bureaucracy. The debate between free market capitalism and government regulated socialism is now over. And free markets have won. If you have a problem or want to produce something of value, don’t count on the government to deliver it. Go to the free market, and in there you will find people willing to expend their labor and capital to solve those problems. What makes a free market function efficiently, moving resources around to their most productive use? How does the free market adjust so quickly to remedy excesses and shortages? The key is the mechanism of prices. Prices don’t just tell us how much something costs at the store: prices pull together all the information available in the economy: about what consumers want, how much they want, and how to most efficiently produce those goods. Resources of production ( land, labor, capital, ideas) respond to the information contained in prices and move accordingly towards where they are in the shortest supply and away from where they are least required. To illustrate this let’s go back to the example of the pencil. What happens if the demand for pencils increases? The store keeper, seeing the opportunity, raises the price of pencils, and orders more. This sends a signal to existing producers to supply more pencils because it provides them the possibility of more revenue and increased profits. The demand for cedar wood goes up, and the loggers in Oregon, in turn, hire more labor to cut more cedar trees, the copper and graphite mines and rubber plantations increase their output, and so on. As if by magic all the resources needed to meet this increase in demand materialize automatically without the direction of a central authority. Eventually, the increased demand for resources puts upward pressure on the price of these resources and the cost of labor, saws, wood, graphite, copper, rubber, etc. all increase as a result. As a result, the cost of making the pencil goes up. In response to this, its demand falls, and the system again adjusts the production of wood, graphite, rubber, etc. accordingly. All this happens without a central planner or a government committee sending orders to ratchet production up or down. The price system conveyed all the information required to allocate resources to make pencils. The price mechanism also works to purge the system of inefficient producers. It pushes out the old to make way for the new–the creative destruction of the market. Kodak was a huge conglomerate with 145,000 employees and revenues of almost $ 16 billion in 1996. But it declared bankruptcy in 2012 because it failed to counter a drop in film sales with a strategy towards digital cameras. Another illustration of the creative destruction of the market is the airline industry. Every year a few airlines close down because of their inability to respond to changes in consumer preferences and prices. The free market moves fast, and those that can respond to the signals it sends, survive. The others perish. This is why slow moving government bureaucracies are incapable of running businesses in today’s fast moving and highly competitive market economies. In India, a government that takes two years just to tender the construction of a 20 Km road, is also running 235 of the largest companies in critical sectors like banking, insurance, energy, steel, cement, fertilizer, airlines. It is no wonder then that many of them run at a loss. Air India, a government-run airline, lost almost Rs. 1,000 crores last year–a year in which other privately run airlines like Indigo made record profits. Price controls, imposed by the government, distort free markets by destroying the ability of the pricing mechanism to provide accurate information about demand and supply. And without freely determined prices how does one know whether to produce apples or oranges? The Minimum Support Price(MSP) is a good example of the damage caused by price distortions. The Government of India fixes the minimum price on about 20 food crops. The stated objective of the MSP is to help the small farmer. But in reality, it does nothing of that sort. The small farmer benefits very little from a minimum support price because he only sells a small fraction of his production (the rest is used for his personal consumption). It’s the wealthy farmers who benefit the most. Ironically, they need MSP the least because they have mechanized farming and better yields. So the price distortions caused by the government’s MSP policy don’t help the farmers who need it most, but instead, help those who need it least. Studies also link food price inflation in India to the MSP policy. There is an oversupply of food grains supported by the MSP, and a huge deficit of non-MSP crops like fruits, vegetables, and legumes. This imbalance creates volatility in food prices. In a free market, supply and demand would determine the prices of food crops. A rise in vegetable prices would imply a shortage and signal farmers to grow more vegetables. But minimum prices distort the signaling mechanism and cause massive inefficiencies in the agricultural sector. The MSP also distorts the free markets by allowing one group to benefit at the expense of another. The consumer suffers twice: once in taxes for the MSP subsidy and again by paying a higher price for food. The problem with a command economy run by the government is that a small group invariably controls the planning process. This group decides prices, quantities, resource allocation, distribution and other relevant market variables. In a free market everyone plans based on their information, incentives, and learning. The information and collective judgment of the vast market will always be superior to that of a small group. The bottom line is that free markets are the preferred economic system to grow the economy, generate wealth, and lift people out of poverty. While free markets are not always perfect and market failures do occur, the price mechanism allows producers and consumers to respond quickly and adjust their strategies accordingly. A system managed and controlled by the government cannot never react as rapidly and as efficiently as the free market and is bound to collapse. Is India a free economy? How does India compare with other countries when it comes to free markets and economic freedom? Not well. In fact, not well at all. The Heritage Foundation, a global think-tank publishes the Index of Economic Freedom. In the 2017 Index India ranks a miserable 143rd ( out of 186 countries) and slipped down 20 spots from its ranking of 123rd last year. How can India become an economic powerhouse if it ranks 36 spots below Bhutan ( 107th), and even two spots below Pakistan ( 141st)? Can India some day become a global economic power or will it continue to be mired in poverty? It can, but only if the government gets out of the way. Ronald Reagan correctly pointed out, “ … growth, prosperity and ultimately human fulfillment, are created from the bottom up, not the government down.” Only when the people elect a government which understands this will things change for India. Ironically, India ranks in the top 20% when it comes to business sophistication. Clearly, these smart business minds are being held back by onerous regulations and excessive government bureaucracy, coercion, and authority. Yes, India can become an economic powerhouse but ONLY if it becomes a truly free and open market.